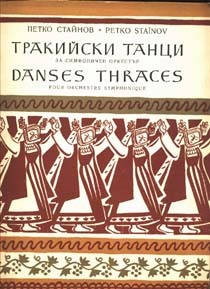 Parts: Paidoushko, Mechkarsko, Horo, Rachenitsa. Orchestra composition: 2 Fl., 2 Ob., 2 Cl., 2 Fg., 4 Cr., 2 Tr., 3 Trb., Tb. ; Timp. picc., G. C.; Vni I, Vni II, Vle, Vc, Cb. 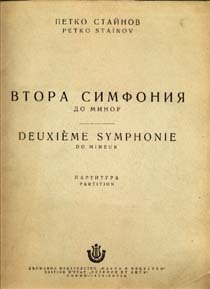 First performance: Sofia, Jan. 15, 1927. Bulgarian National Philharmonic Orchestra, Todor Hadjiev - conductor. Ruchenitsa is staged as a one-act ballet at the National opera in Sofia. 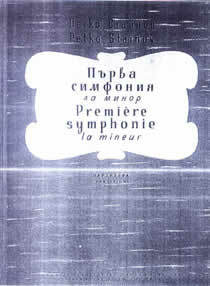 Libretto by Asen Gavrilov. Choreography by Asen Gavrilov. Premiere on Oct. 10, 1971. 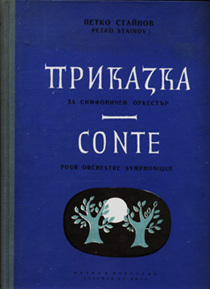 Score: Sofia, Nauka & Izkoustvo Publ., 1951. Discography: Balkanton BCA 500; VSMS 7631 (60); CD Balkanton ADD 030211 Classics of Bulgarian Music. Petko Stainov. First performance: Sofia, Jan. 1, 1928. Bulgarian National Philharmonic Orchestra, Isai Dobroven - conductor. 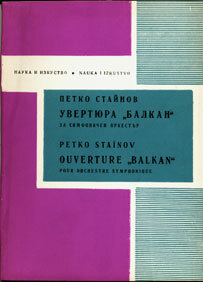 Score: Sofia, Nauka & Izkoustvo Publ., 1963. Discography: CD Gega New GD 259 Petko Staynov Compositions. Parts: Damned Tilileiski forests, Dragon, Lullaby, A thumb of a man with a cubit of beard, A winding fairies horo. Orchestra composition: Picc., 2 Fl., 2 Ob., C. ingl., 2 Cl., Cl. b., 2 Fg. ; 4 Cr., 3 Tr., 3 Trb., Tb. ; Timp., Campanelli, Tamb. picc., Tamburino, Trgl. Tam-tam, G. C.; Vni I, Vni II, Vle, Vc, Cb. First performance: Sofia, Apr. 2, 1931. Academic Symphony Orchestra, Sasha Popov - conductor. 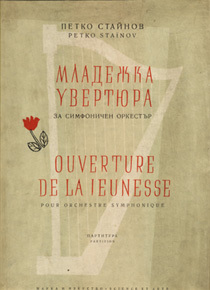 Score: Sofia, Nauka & Izkoustvo Publ., 1958. Discography: Balkanton BCA 556; CD Balkanton ADD 030211 Classics of Bulgarian Music. Petko Stainov. Orchestra composition: 3 Fl., 2 Ob., C. ingl., 2 Cl., Cl. b., 2 Fg., Cfg. ; 4 Cr., 3 Tr., 3 Trb, Tb. ; Timp., Tam-tam; Vni I, Vni II, Vle, Vc, Cb. First performance: Sofia, November, 1936. State Philharmonic Orchestra at the National Opera, Tsanko Tsankov - conductor. Score: Sofia, Nauka & Izkoustvo Publ., 1970. 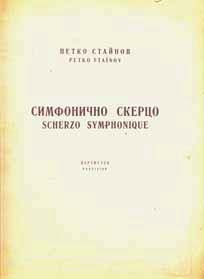 Discography: CD Petko Gruev Staynov Foundation Petko Staynov’s 110 Anniversary. Orchestra composition: 2 Fl., Picc, 2 Ob., C. ingl., 2 Cl., Cl. b., 2 Fg., Cfg. ; 4 Cr., 3 Tr., 3 Trb., Tb. ; Timp., G. C., Cymb. Tam-tam; Vni I, Vni II, Vle, Vc, Cb. First performance: Sofia, Dec. 3, 1939. Czar’s Military Symphony Orchestra, Sasha Popov - conductor. Score: Sofia, Nauka i Izkoustvo Publ., 1950. Discography: Balkanton BCA 500; CD Balkanton ADD 030211 Classics of Bulgarian Music. 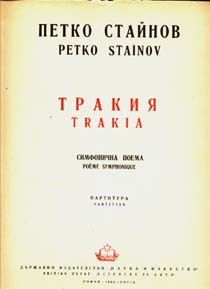 Petko Stainov. Orchestra composition: Picc., 2 Fl., 2 Ob., C. ingl., 2 Cl., Cl. b., 2 Fg., Cfg. ; 4 Cr., 3 Tr., 3 Trb., Tb. ; Timp., Tamb. picc., Trgl., Ptti, G. C, Piano; Vni I, Vni II, Vle, Vc, Cb. Score: Wien, Universal; Sofia, Nauka & Izkoustvo Publ., 1955. Discography: Balkanton BCA 556. CD Gega New GD 259 Petko Staynov Compositions. Parts: Adagio sostenuto, Andante tranquillo, Allegro molto, Allegro moderato. Orchestra composition: 2 Fl., Picc, 2 Ob., C. ingl., 2 Cl., Cl. b., 2 Fg., Cfg. ; 4 Cor., 3 Tr., 3 Trb., Tb. ; Timp., Tamb. picc., Trgl., G. C., Ptti, Arpa, Celesta; Vni I, Vni II, Vle, Vc, Cb. First performance: Sofia, March 10, 1946. State Symphony Orchestra at the Radio-broadcasting Directorate, Asen Naidenov - conductor. Orchestra composition: Picc., 2 Fl., 2 Ob., C. ingl., 2 Cl., Cl. b., 2 Fg., Cfg. 4 Cr., 3 Tr., 3 Trb., Tb. ; Timp., Trb. mil., Trgl., Ptti, G. C., Arpa; Vni I, Vni II, Vle, Vc, Cb. First performance: Sofia, Oct. 4, 1949. Sofia State Philharmonic Orchestra, Sasha Popov - conductor. Score: Sofia, Nauka & and Izkustvo, 1953. Discography: Balkanton BCA 11388. CD Petko Gruev Staynov Foundation Petko Staynov’s 110 Anniversary. Orchestra composition: 2 Fl., Picc., 2 Ob., 2 Cl., 2 Fg. ; 4 Cr., 3 Tr., 3 Trb., Tb. ; Timp., Trgl, Tamb. picc., Ptti, G. C.; Vni I, Vni II, Vle, Vc, Cb. First performance: Sofia, Apr. 15, 1953. State Radio-Orchestra, Vladi Simeonov - conductor. 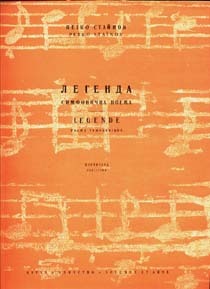 Score: Sofia, Nauka & Izkoustvo Publ., 1960.